Won't iTunes let you put movies on your iPod? Sometimes your movies can be imported into movie library and played in iTunes fine, while when you sync with your iPod, iTunes pops up a message: "movie was not copied to the iPod because it cannot be played on this iPod". Not all iTunes videos can be transferred to iPod. There are lots of limitations including resolution, bit rate, aspect ratio, size audio codec, and so on. You need convert them to iPod compatible video. Even you already convert your video files to iTunes compatible video MP4, MOV, M4V, sometimes you are still unable to copy them to iPod due to the false specifications output by not so professional video converters. Here is a two solutions to help you fix the "cannot be played on iPod" error message. It's dead easy. The solutions are also applied to solving "cannot be played on iPad/iPhone/Apple TV" error massage. 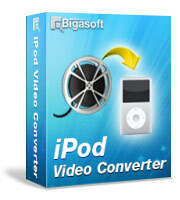 Download Bigasoft iPod Video Converter (for Windows, for Mac), then install it. Locate the video files which cannot be transferred by iTunes, drag them from iTunes or Windows Explore/Mac Finder into the iPod video converter. Click "Start" button to start video conversion. After conversion, drag the output video files to your iTunes and voila. If you are trying to sync videos that are ripped from DVDs to iPod/iPad/iPhone/Apple TV by Handbrake and other DVD conversion software, iTunes reminds you "cannot be played on iPod/iPad/iPhone/Apple TV". In such case, in order to retain much video and audio quality of the DVDs, it is better to download and hire Bigasoft DVD to iPod Converter (for Windows, for Mac ) to rip your original DVDs to iPod/iPad/iPhone/Apple TV videos. 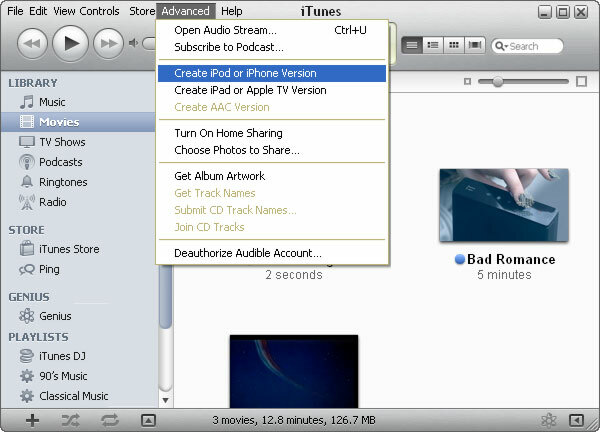 Locate and select the video file which cannot be transferred in your iTunes Library, and from the Advanced menu, choose Create iPod or iPhone Version. While converting, you will notice an item named "Converting..." appear in the iTunes Source list. When the conversion is complete, iTunes will create a copy of your movie in your library. There will be two movies listed with the same name. Converting with iTunes is a free and built-in solution yet it is a terrible experience because of its dead slow conversion speed. Another issue is that it is impossible to retain much video and audio quality or create high definition video for enjoying high quality and high definition video on iPod/iPhone/iPad/Apple TV. 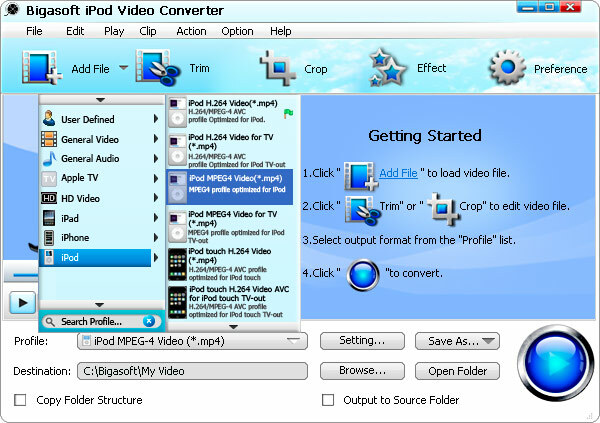 While using Bigasoft iPod Video Converter for conversion to solve "cannot be played on iPod" or "cannot be played on iPad/iPhone/Apple TV" issue is a much faster (6x faster) and a pleasant job which also enables you to animate videos with a smart video editor like video trim, crop, clip, add water mark, and more. Besides, enjoying high quality and high definition video on the go comes true for you. What's more, you can save it for conversion from many video formats to iTunes and Apple devices supported.